How do I make a two piece wing? 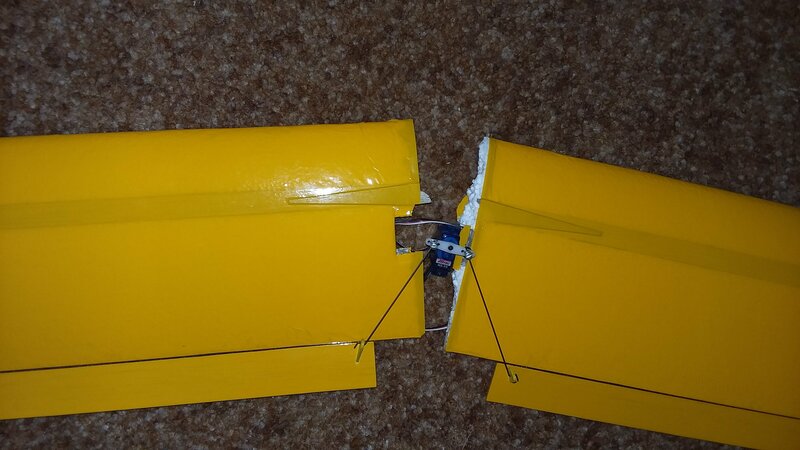 Hey guys, I have always been curious how people make their two piece wing mechanisms. I am currently in the design phase of a 2.5m balsa glider, which will need a two piece wing to be transportable. Any ideas will be much appreciated! All the ones I built had steel rods sticking out about 4" from each side of the fuselage and aluminium tubes in the wing, so you just slid on the wings, then there would be some sort of retaining mechanism, like a hook that went through a hole in the fuselage (within the wing root, so hidden when wing is assembled) with an O-ring or rubber band to stop the wings sliding back outboard. If the wing sits on top of the fuselage, they still have the steel rods and aluminium tubes as a joiner, but instead of the hooks, each wing has a peg at the front that goes into the nose part and a single wing fixing bolt at the rear. I guess these days, you can use carbon fibre tubes and rods. So the steel rod sleeves inside the aluminium? How far outboard does the aluminium go? Also, where could I find tubes just the right size to fit inside each-other? I’d look at a carbon fiber tube that when about half way into each wing half. Now it’s easier to transport. I did that to my first balsa build which was a pure glider. It happened while I was high starting it. held up great with no signs of stress for the first few flying days, but one day it just clapped its wings! When I finally fixed it I decided to put my power pack F motor in it so I won't have to high start it, and I now get 35 minutes flying on an 800mah 3s! How would I find tubes that are just the right size to slide inside each-other? You do not state what spar arrangement if any is already fitted to each wing. Also you do not mention what Dihedral angle, (if any), is used in the design. When planning to have removal wings it is also wise to know what weight the plane is and as to whether the wings are to mount directly to the fuselage sides or if there is a central stub if wing section which is integral to the fuselage. You will not only need to be able to support the plane when flying but also to ensure that the wings are properly secured in location as well as in incidence angle. Sure, you can add massively strong structures to mount the wings but remember that extra weight reduces performance and increases the damage in the event of a crash! I have many planes with short connecting spars most of which either "key" into the fuselage or have locating pins, (lengths of CF), to ensure that their incidence never varies. A little more info would help in narrowing down your best solution and the one which gives best strength for weight! Dunno about Merv, but for me, mostly specs and luck. I have discovered that most of the cheap arrow shafts I get around here have an ID just over 6mm . . . so a 6mm carbon shaft is perfect for an interior shaft. My dad gave me an idea for this particular build though, so I am mainly getting ideas for future projects, so I will be able to change my spar layout if I have to. This one doesn't have any dihedral, neither does my next project. It would still be great for me to know how to make a two piece wing with dihedral though. I've never thought of building anything that would need a two piece wing that doesn't have the wing mounted on top of the fuselage with rubber bands. I'm keen to learn any methods for any sort of planes to help me come up with my own method for the different planes I end up building. when designing a wing support mechanism or structure you will need to decide where the forces are to be distributed, (into the opposite wing or into the fuselage structure). With CF I do like to key the wing into the fuselage to stop incidence angle changes and then use a spar tube in the wing to handle the forces trying to bend the wing. I then use a CF tube through the fuselage and into both wings. The spar tubes and the CF tube take the bending forces quite well though the "key" in the fuselage must be able to bear the load of the entire aircraft multiplied by the "G" forces you intend to generate. If you wish to support the fuselage directly on the CF spar then you will require a suitable piece of support structure, (a block or similar) through which the CF spar will pass. 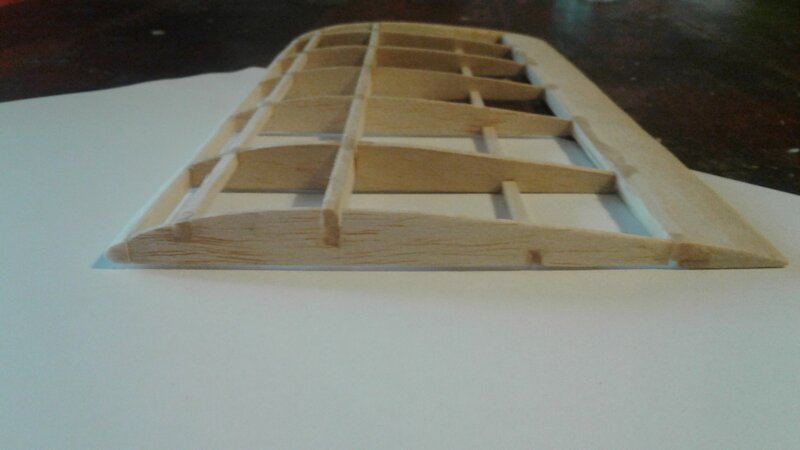 For short joining pieces as with a dihedral wing I prefer to use Plywood which has been shaped to include the dihedral angle. This time I build a solid box to fit the plywood joiner piece, (the dihedral piece). On small models of balsa this can be as simple as adding a sub spar on the bottom of the wing and gluing balsa sheet between the 2 spars, (this makes the box). The second spar rarely needs to extend beyond the third rib and often I just add an extra set of ribs between the second and third which is where I terminate the added added spar. 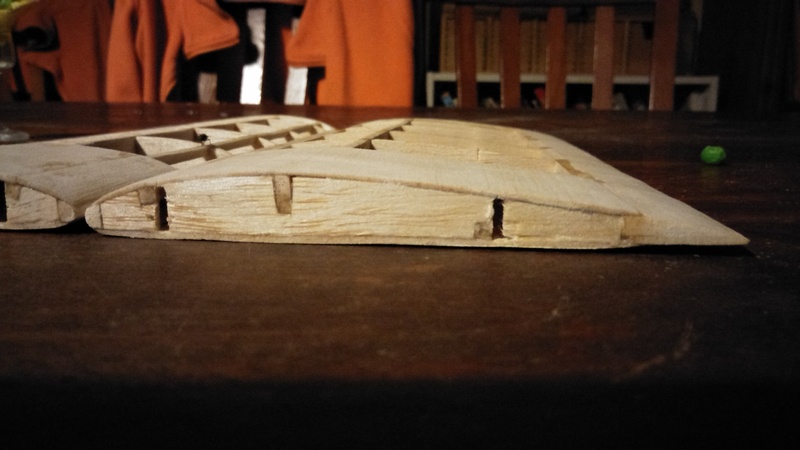 The dihedral shaped piece of plywood is a single piece that goes through the fuselage and protrudes on each side of fuselage where the wings are to be mounted. For a joint where the wing sits atop the fuselage you can still add the extra short spar etc in each wing and glue the dihedral brace into one of the wings. On the other wing the brace just slides into the inter-spar cavity. Check the wings for weight balance and if necessary add a tiny weight to balance the wings when assembled. The above is just a tiny number of methods used successfully and reliably. Holding the wings together in flight is a different matter and subject to the jointing method selected. Thanks Hai-Lee, I will definitely check back here for my next project. Could you post some pictures of some of your two piece mechanisms please? Your descriptions makes sense, but photos will make everything even clearer. Sounds like you've made loads of interesting planes! This is the two piece mech I used on my current build. Yeah, I know it looks messy! There is no slop, and it feels quite sturdy with the two popsicle sticks. Does anyone for-see any problems with this idea? The problem might be the popsicle sticks. Face it, popsicle sticks are made from cheap wood. I just went through several dozen popsicle sticks trying to find a few that were straight and stiff. Every stick I looked at was rejected for some defect. I ended up cutting my own stock on a saw to get wood that was straight with clean grain. Another cheap source of clean straight wood is paint stirrer sticks. Sorry, let me rephrase. I haven't ran into any problems yet. Do you think I might run into any later? BTW, my popsicle stick collection is pretty good quality, with very straight and strong wood. If you have straight strong sticks then no problem. You don't want the wing joiners to be the weakest link in the chain. Yeah, that would be bad! I want to stress test them so I know their limits, but I don't know how to test them standing up on edge like they are in the wing. Any ideas? I had to say it. You have to use the time honored test method of building and flying it. Yeah, I'm confident that they are strong enough, I'm just curious to know their limits.